In May 2000, my friend Jacob and I paid a visit to the Spitfire Graveyard in Sheffield, in the industrial heart of England. For someone living in an over-organised country, used to encountering mostly sound, restored cars and no wrecks, this is quite a place. First of all, it's an adventure just to find it. 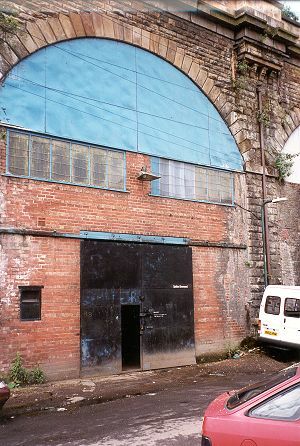 The yard occupies two unassuming railway arches in a back street in the centre of Sheffield. Inside, it's dark and damp, but it's absolutely packed with parts. It's amazing how they'll find anything you need, provided they have it in stock. Three of several more or less complete cars in stock at the moment of our visit. 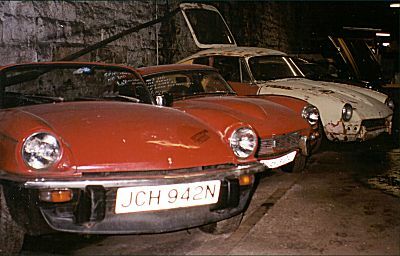 From left to right: a 1500, a Mk3 with an original hardtop and a GT6 bonnet, and a GT6 MkI or MkII. The text chalked on the windscreen of the second car reads "Mk3 Spit, tax exempt, only need bit of work for MOT etc. - £595". Very optimistic, if you ask me, although the price didn't seem bad. 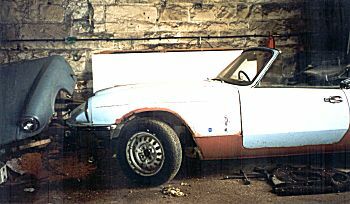 A surprisingly rust-free 1500 body, flanked by an almost dead Herald convertible and a number of 1500 bonnets. I was sorely tempted by the Java Green bonnet in the background, but it was more frayed at the edges than I was prepared to accept. Graveyards can conjure up strong emotions for some people. 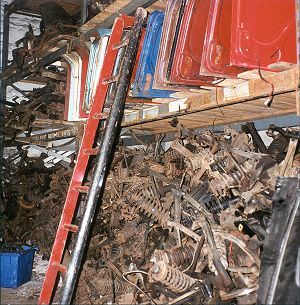 If you're not sure you can stand the sight of run-down Triumph Spitfires left to rot by their unloving custodians and then sold on to be broken for spares, do not visit the Spitfire Graveyard. Jim Morrison may be dead, but some of The Doors are still alive (if not all well) at the Spitfire Graveyard, ready to be recycled! 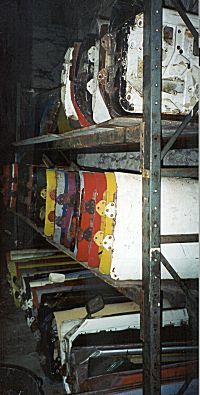 These are among the many parts on Spitfires that will eventually rot, so I'm sure they will all find happy new owners. Grilles and bumpers galore. If you really can't find a bumper for your Spit anywhere and you're not prepared to pay through the nose for a (mediocre quality) new one, the Spitfire Graveyard is the place to go. 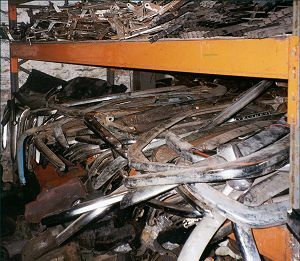 None of them are particularly nice, most of them have plenty of rust, but if you can find a good chrome plater, you might just end up with a nice bumper. And here's your stack of back axles, Sir! Always a favourite item for replacement with Spitfires, these. Some 1500's with their 2" wider rear track will eat wheel bearings and universal joints like there's no tomorrow, so it's good to know there is still a supply of reconditionable items left somewhere. 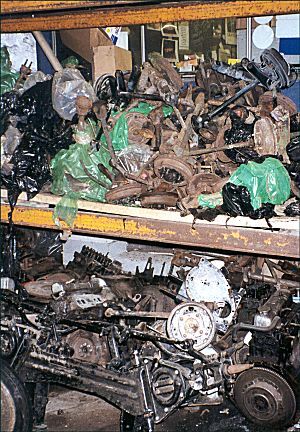 Below is a heap of 6-cylinder engines and a front axle of unknown heritage. How many gearboxes would you like? With or without overdrive? Shall I wrap them up for you or will you eat them here? 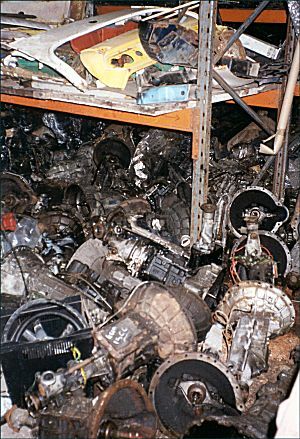 It may look like a lot of rubbish, but if you look closely, you can see gearboxes complete with overdrive here, seemingly ready to drop into your standard Spitfire. Of course, many of these will be terminally tired and need a complete rebuild, but they're a nice base to work on, especially since 'boxes-with-overdrive aren't exactly easy to come by in all parts of the world. On the shelf are some body items like a 1500 rear deck and half a rear lamp panel. Loadsa front suspension units below, Mk3 and 1500 boot lids above, various nondescript parts all around. On the opposite shelf, there were stacks of windscreens. Still, they have a turnover of about three cars every week, which they source from all over the country. These days most, if not all, are sold on in one piece. The Spitfire Graveyard is run by friendly and helpful people. The parts are not too expensive. Just don't expect a glitzy operation. 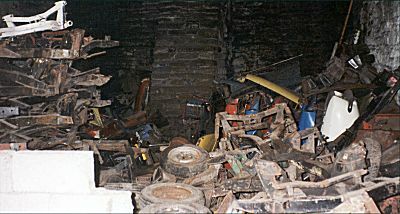 The place seems fairly well organised, but the premises are dark and damp and most of the parts are old, dirty and rusty. Excellent if you are trying to restore your Spit on a tight budget or you need that obscure, unobtainable part, like a heater fan knob (part nr. 622229). But don't bother calling if you're after a concours interior, a perfect, unscratched windscreen or a shiny, ready-to-mount bumper. If you want quality new bits, you'll be better off visiting Rimmer Bros. in nearby Lincoln. 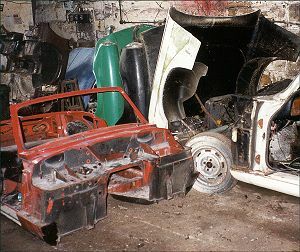 As of October 2001, The Spitfire Graveyard has its own website.